Is the media data dependent? Depends, of course, on what you mean by “dependent.” One year ago, as December 2017 dawned, you couldn’t go a day even a few hours without some mainstream outlet publishing an ode to the LABOR SHORTAGE!!! A full part of the hysteria of the time, the idea of globally synchronized growth last year was started in search of data rather than being derived from it first. 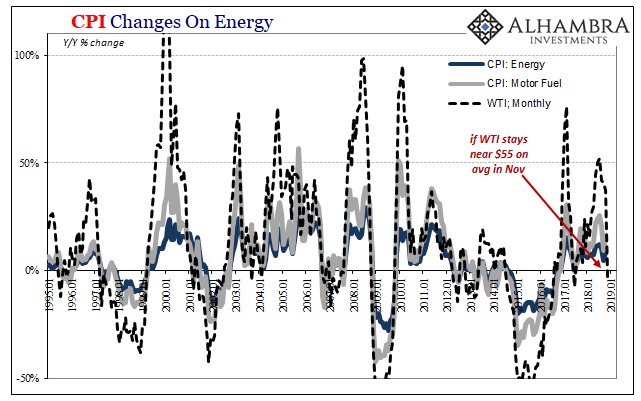 So, as oil prices rose and the major inflation rates came back with them the labor story was attached to the WTI story all with the hope that both were merely the first steps in a much bigger process. That would include wages. A labor shortage, a real one, would mean fierce competition for workers, a bidding war that benefits pretty much everyone – if the economy is there for it. In 2017, there was so much guessing and stretching data to try and fit it all into globally synchronized growth. That’s what markets were pricing, too. Yellen handing off to Powell was counting on oil to indicate economic strength that would allow businesses to compete for scarce workers. If oil was just moving up off a very low bottom and didn’t really move on those perceptions? Bad news for policymakers. That’s largely where we are now, everyone trying to come to grips with the WTI fakeout. And it wasn’t really oil that was the matter, it was the hysteria written into it because the media like policymakers puts together its narrative on emotion instead of data and honest analysis. They are all in the tank for the idea of a technocracy, and if the economy fails in 2018, which it already has, then the lack of growth and recovery over more than a decade drives a stake right through the heart of that ideal. 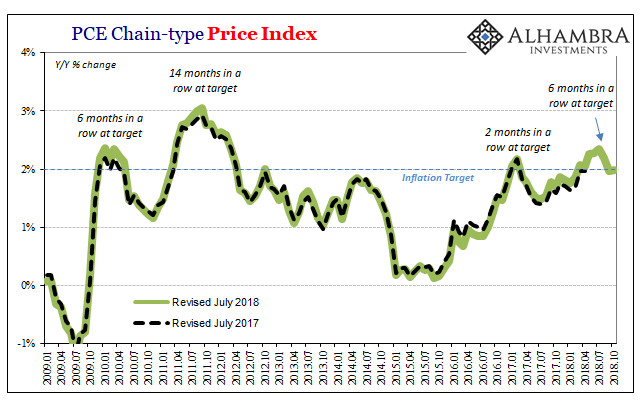 The PCE Deflator in October 2018, the latest data released last week, showed consumer prices rising on the wrong side of the 2% target again. After a string of six months, owing to the last benchmark revisions using the 2012 reference dollar, in October the direction of inflation was already lower. The core rate dropped to 1.78% year-over-year, the lowest since February and the Verizon scare. As part of the narrative about inflation, in 2017 the frustrating levels of especially core inflation were explained via the one wireless data provider’s entry into unlimited data plans. It created an inverted bubble, supposedly, where the annual comparisons would be skewed by this one “transitory” factor. There was real inflation out there in the economy being distorted by Verizon. In early 2018, these had moved past wireless telephony so that the core rate would more accurately reflect the underlying wage-driven price pressures. Inflation would clearly accelerate beyond just WTI and Jay Powell would be justified in his “hawkish” stance. So they said. Only now core rates as the headline are moving the wrong way. And that’s just in October. The big WTI reverse isn’t even in these figures yet. That means next month when November’s headline comes out it is likely to be significantly less than 2% with core inflation probably confirming for another month the lack of everything 2018 was supposed to be. One big reason why the eurodollar futures curve inverted many months ago was the market sense that over time even Jay Powell wasn’t going to be able to ignore what was really going on in the global monetary system (not that he would have any idea what that was or why). Certainly not after May 29. 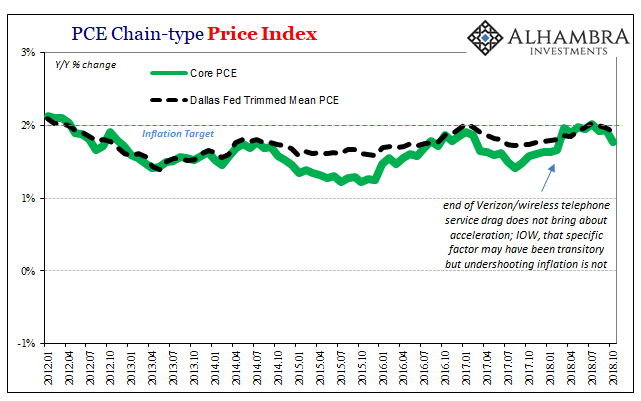 As the PCE Deflator trends lower all over again, he could still dismiss this data calling it “transitory” like his predecessor but it will be much harder for him to do so. An unemployment rate at 3.7% without inflation cannot be the real unemployment rate. The data doesn’t depend after so many months and years. He might want to at least follow the mainstream media’s trend. The LABOR SHORTAGE!!! stories are conspicuously fewer in these last months of 2018.